I made the burgers this afternoon, individually wrapped them in foil and then popped them in the freezer for a couple hours to help them keep shape. The turkey did not stick together very well with the peach pieces, but after a few hours in the freezer an then and hour in the fridge they were the perfect shape. Makes me think this would be a great make ahead meal! As far as taste goes, it was really a great combination of sweet, spicy and salty. I chose not to serve these with any bread (the recipe calls for serving with garlic toast) so I added .5tsp garlic salt to my peach-blueberry mix and it was perfect! Overall this was a delicious recipe, so easy to make and will definitely be making its way into our rotation, so long as I remember to buy the peaches! Place ground turkey, chopped peach, salt, and pepper in a bowl and mix by hand. Shape turkey mixture into four 1/2-inch-thick patties (if necessary, dampen hands first). Meanwhile, coarsely chop remaining peaches. In a large skillet combine peaches, blueberries, garlic salt and chili powder. Cook peach mixture stirring occasionally, over medium heat for 5 to 6 minutes or until heated through and juices are beginning to form. 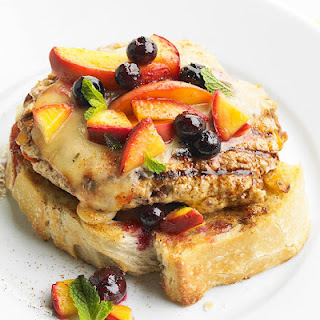 Top turkey burger withsome of the peach mixture and serve. *Due to rain we had to cook these on a grill pan inside and it took a bit longer, about 10 minutes per side. ***Original recipe called for topping with fresh mint, but I didn't use it so I left it out of th recipe. I feel the hunger of Turkey burgers with peaches and blueberries now and thanks for sharing this delicious recipe. 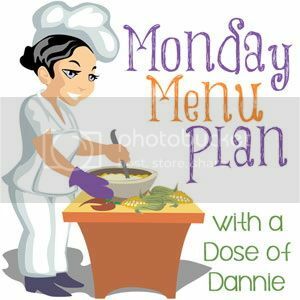 Meal Planning Monday...the back to work version!